i am Maik from Germany. Collecting pinball and have a Sega Hang On and a Outrun sitdown cabinet. Now my first Candy Cab is coming (Blast City). Hope to get more into it, as i played those often at Akihabara. Hello everyone. My name is Scott. Long time arcade junkie. Bought my first cabinet last year(Vewlix), and I'm hooked! Hello. Aval0n here. I'm in IT and have been making repro artwork for classic arcades but my love for capcom games and competing in evo got me into my own vewlix L set which I upgraded to 1080p. Just looking to get to know others knowledge share etc. Hello everyone. New to this forum and arcade collecting. Have only been doing it for 1yr. I am in the IT field. I am still learning and looking to contribute to the community when i can. I currently own 5x cps2 boards one being a a Darksoft Multi, Neogeo MV1ACH and a 2 slot board, IGS PGM mobo with not games yet and a Naomi with no games yet. Will be purchasing a Darksoft MVS multicart and really want to purchase and own at least one CAVE shmup arcade board. Hope to make friends here and purchase some hardware. Long time lurker here, this place is filled with info spent many nights reading. Hi all. 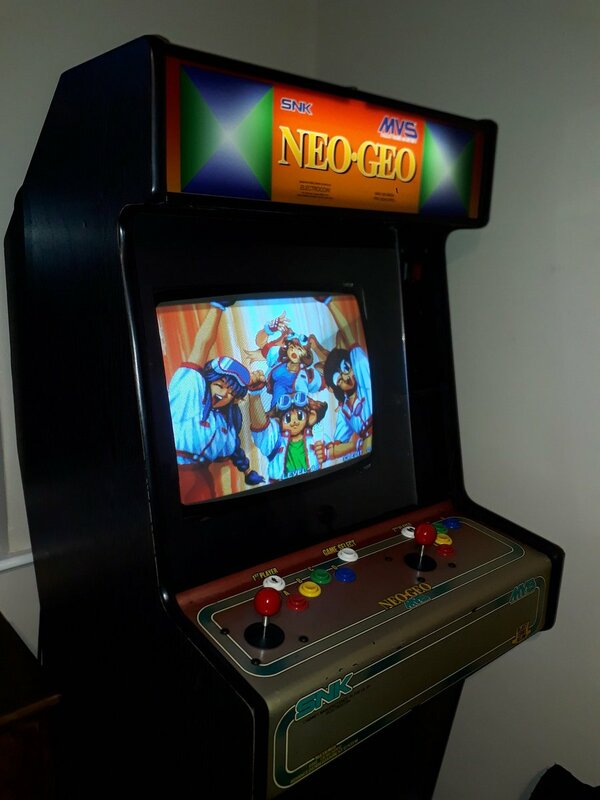 I’m from the UK and have been replacing my home console collection with arcade pcb’s since getting my unusual Neo geo MVS ‘Playvision’ arcade cab for my 40th birthday. 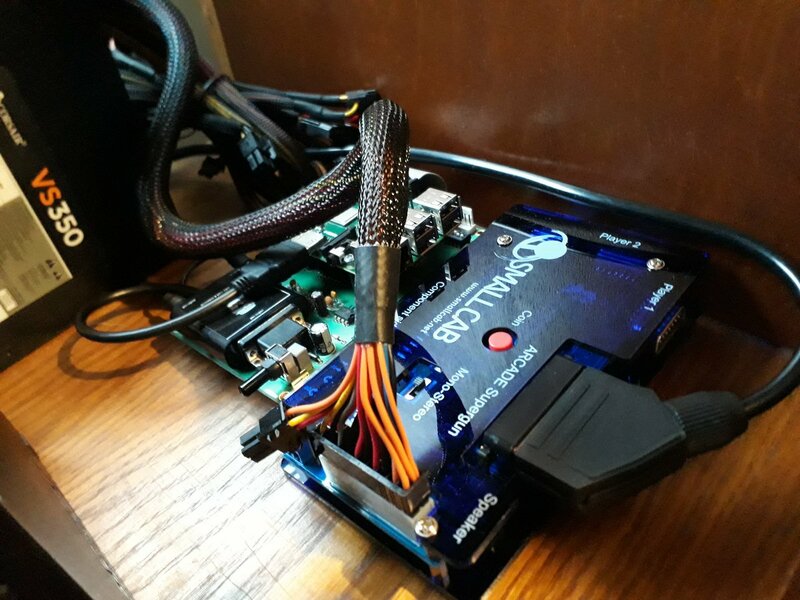 I only have room for one cab (currently in our dining room) so I have a smallcab supergun connected to my CRT TV for playing vertical shmups. Plus a Picade form playing all those games I cant afford to buy! I’m pretty much finished with collecting PCB’s unless I can find my holy grail - a good price ‘Nostradamus’ by Face board. I’ve bid on a couple on Yahoo japan auctions but keep losing out! 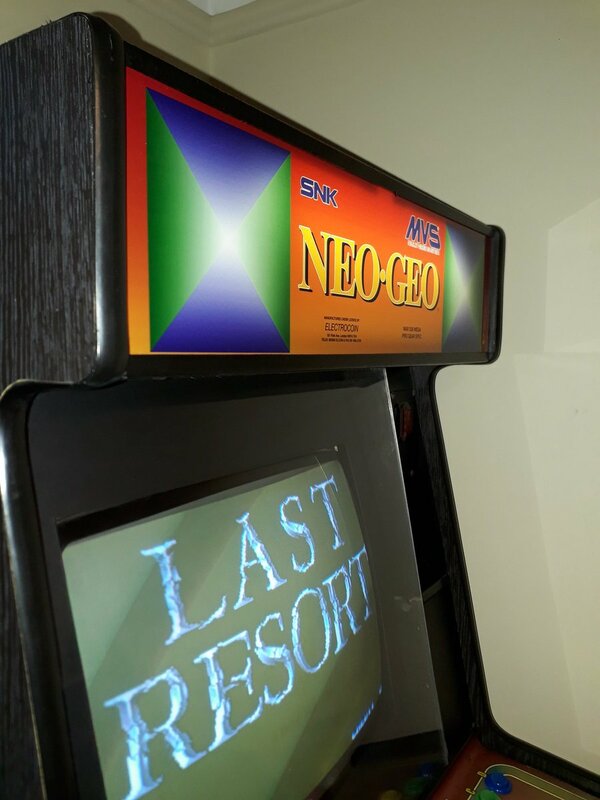 I've never seen a Neo Geo cabinet like this before. Is this custom? I dig that! Name is Yams, the kinda name you would expect a baggy jeaned arcade rat to have (these days I feel like that has less of the negative connotations that it used to). I wanted my first post to be something useful, like stuff on the Sigma Raijin. I've been working on documenting the entire thing (Wiring diagrams, schematics, parts lists, etc) as there is not a ton of information out there, and a LOT of mixed information that clashes quite a lot. Also some design changes, like better strain relieving (stock = wire tied to the coin/start/switch boards), stand offs for the coin/start board and grounding. All that fun stuff big time fan of the ArcadeOtaku Wiki, and some of this could be useful when I get that long post written out. 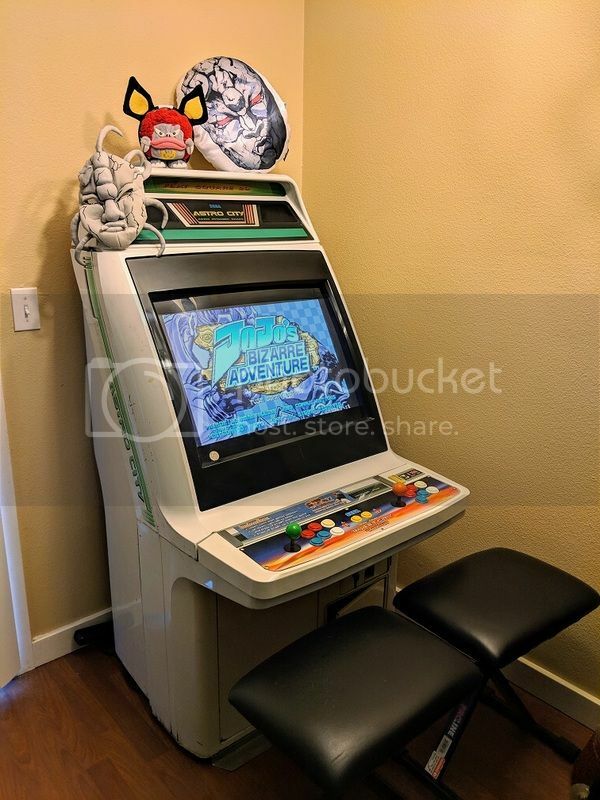 Haven't been on here in a couple of years but thought I would reintroduce myself; rocking a Sega Astro City cab with a Game King installed. Replaced the monitor recently with a flat screen (kept blowing screens). Took me years, but finally found the original card, paperwork, and inserts for the Jojo's Bizarre Adventure arcade game. Should be shipping from Japan next week. WOO! I'll be ordering some Taito chairs soon and a plexi for the top. Really excited to be active again with you folks. Hello Everyone! New to the forums here since I just picked up my first New Net City! Starting my collection with a System 256 system, but I hope to expand it to include Naomi and a ST-V boards and games. Now I need all the information I can get to complete my dream setup, so I hope to be on here a lot more! I'm from Spain, I'm 42 years old and my passion is arcade games. I've got a very few PCB's, I stopped buying a few years ago but I'm back again. I've got my favorite game between them: an original Final Fight CPS. 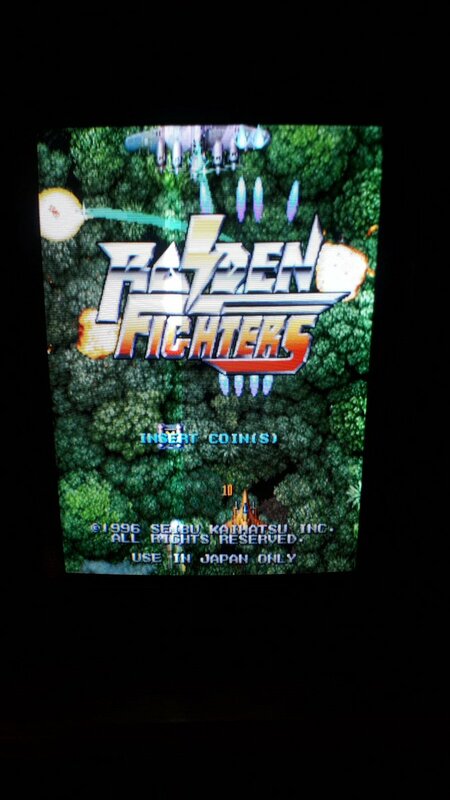 I love shmups, specially Cave games. I'm not a good player with Cave games but I enjoy playing with them. I've got the three Cave PGM cartridge conversions, original PCB have a crazy prices. My favorites are Futari Black Label and Ketsui. I'm looking for a unicorn (AKA Egret II, Egret III or Atomiswave SD). I hope to buy one this year at reasonable price. I expect to learn a lot in this forum, and meet good people too. i'm a 43 years old french guy. My first cab was an Euro cab i bought last year. Since then I bought some other cabs : an SNK NEO25, an original 220V NAC, and last week : A canary Taito. Thanks for this forum and all its precious informations. I'm here to level up and learn more about arcade ownership and possibly purchase my very first one. I enjoy shoot em up, fighting games and puzzle games. Excited to learn from the site and members. I’m from France, i’m 40 old. My first cab is a NNC and i love SNK games especially the Metal Slug and KOF series. I’m 37 and from France too ! Hope to meet other arcade fans here! 34'', 26'', and 20'' generic cabinet, and an "okbaby"
originall pcb: naomi mvc2, MVC, samurai shodown and hat trick hero. Bootleg: SF2, MK, pandora box4s+.